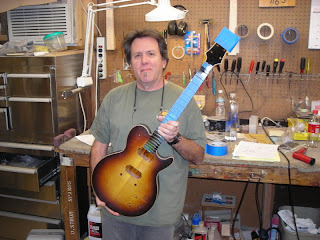 I just looked in on the Tyler Guitars website and was pleasantly surprised to see that Jim Tyler has started a blog. And there are some major changes happening at the house of Tyler. First off, he's announced that the Tyler Classic is being discontinued and that he is also thinking "long and hard about the Studio Elites." The legion of Tyler fans out there will be staring at their computer screens in disbelief, with mouths hanging open, once they read this. Of course it is all speculation at this point. But Jim's indication that he wants to get away from building super-strats just about gives us a good hint at the new direction he wants to take in the near future. 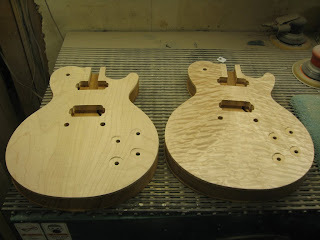 And here are a couple of glimpses at the Tyler set-neck prototypes. 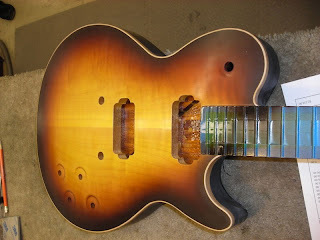 Now if we could just get a sneak peek at the new headstock under that blue masking tape..